Sedum (seed-um), stonecrop; Crassulaceae Family. Tough, hardy, ubiquitous, drought-resistant perennials, mostly of the North Temperate Zone, that may well be called the backbone of an easy-maintenance rock garden. Sedum are enormously useful in an endless variety of situations – besides steps, on walls and at the front edge of borders. They are mostly low spreaders, with succulent, often evergreen leaves and clusters of small, star-shaped, white, yellow, red, pink or rarely blue flowers. All thrive in full sun and almost any well-drained soil. Looking for a robust, versatile, drought tolerant, low maintenance plant that can work in challenging locations? Sedums are commonly called stonecrops because they are often found in the wild growing on rocky or stony ledges. Sedum are succulents which have low water and maintenance requirements. Flourishing in almost any well-drained, sunny spot, they are not particular about soil fertility or pH. Well drained, lean soils are preferred especially during the colder months, as winter wetness can be deadly. 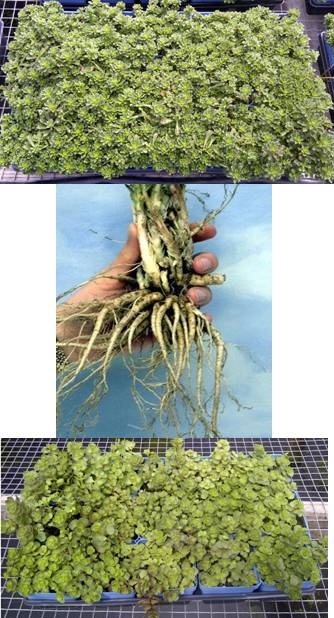 Sedum's shallow root system and water requirements make them ideal candidates for use in vegetated or green roofs. The genus Sedum (about 400 worldwide species) is just one of 33 genera within the family Crassulaceae, other familiar members include Kalanchoe, Crassula (Jade plant), Echeveria and Sempervivum (both known as Hens and Chicks). Succulent foliage enables these plants to withstand extended periods of drought and neglect, but it is their versatility and beauty that make them easy to grow and appreciate. Foliage color ranges from green through yellow, red, burgundy and blue, while flowers can be white, yellow, pink or red with many combinations of the two categories. Growth habit can vary from low ground cover, creeping type plants, to those of a more showy upright stature. Flowering can begin as early as mid summer (especially the ground covers) but it is in the late summer to autumn that these plants come into their own with the taller selections providing color and food for late season butterflies and then continuing to hold their form over the colder months to help with winter interest in the garden. Common names include Stonecrop and Live Forever, both fairly indicative of the ease with which these plants grow. The genus name of Sedum comes from the Latin sedo: to sit. The assumption being that the plants will take root and 'sit' wherever segments that may break off of the parent plant may find a home. Sedum are generally very easy to propagate from stem cuttings and seed. The International Botanical Congress has suggested that several species be removed from Sedum and now classified as Hylotelephium. Upright Sedum such as S. spectabile, S. sieboldii, and S. telephium and their cultivars may now also be referred to as Hylotelephium. Sedum is one of the most popular perennials grown in American gardens because it is very easy to grow and hardy in most areas of the country. Thick, succulent leaves which can store water, allow established sedum to withstand periods of drought. Divide sedum every 3 to 4 years to maintain compact growth habit. Pinching the taller varieties back by half in early summer will also help prevent them from splitting. This plant is not usually bothered by pests or diseases. Excellent as a border plant, container, cut flower or foliage, dried flower or seed heads, drought tolerant, mass plantings, and salt tolerant. Attracts butterflies, Rabbit resistant.